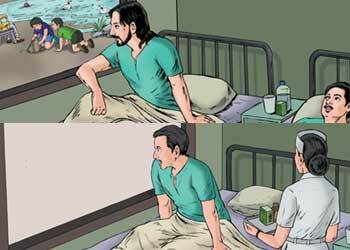 It’s story of two men who were both seriously ill and occupied same room at hospital. One man was next to room’s only window and allowed to get only for one hour to sit up during his treatment of lungs. Other man had to spend all day lying flat on his back. Both men talked for hours. They spoke about their wives, families, home, job, vacation. Every afternoon when men next to room window would sit, he would pass time by describing scenery outside window to his roommate. The man in the other bed would love that one hour periods where his world would be broaden and activities and colors of outside world. As the man by the window described all the exquisite details of outside world and other man would close his eyes and imagine those scene. As days passed guy started to miss seeing sights more and more. His envy got over him and soon turned him sour. He was unable to sleep and thought now should control his life. Late one night as he was lying looking at the ceiling, the man by window started coughing. He was chocking on his fluids and other man watched in dim light of room. As struggling man by window trying to get hold for button to call for help. Even listening this other man never moved, never pushed his own button which would have bought nurse running. In less than five minutes man by window chocking stopped along with sound of breathing. Now there was only deathly silence. Next morning nurse arrived to bring water for both of them. She saw there lifeless body of man by window. As soon as man found it appropriate he asked if he could move to bed next to window. The nurse made the switch and after making sure he was comfortable, She left him alone. After moving to bed next to window, slowly painfully he tried to get up to take his first look out side the window. He was excited that he would finally get to see outside window. He slowly turn to look out the window beside the bed and to his surprise window was facing ” Blank Wall ” . It’s our choice to keep Positive Attitude towards Life. Circumstances are just parts of what makes us Joyful. Pursuit of Happiness is an Inward Journey. If we continue to bit our lips and just before we begin to complain we should shoot that seemingly harmless negative thought as it germinates, We will find there is much Rejoice about. A Soldier’s Sad Heart Touching Story..